Tower Parties starting at $199 in the best place to view world famous Grucci Fireworks. Oct. 10, 2017 – Stratosphere Casino, Hotel & Tower is proud to announce The Highest New Year’s Eve Parties on the Strip, the utmost way to close out 2017 in Las Vegas and celebrate the year ahead. The iconic property is taking guests to new heights as they couple their Tower views with fireworks and unforgettable parties including an amazing, one-of-a-kind Skyline Spectacular New Year’s Eve party 108 floors above the Strip, a special, five-course dining menu at the award-winning Top of the World Restaurant and a DJ-fueled after-party to keep the celebration going well into New Year’s Day. Diners can bid farewell to 2017 with an incredible five-course gourmet dining experience at the Top of the World restaurant. Top of the World has been awarded the Wine Spectator Award of Excellence for 21 years in a row, 2016 Best Restaurant from Nevada Magazine, multiple 2016 Best of Las Vegas awards, and a Certificate of Excellence from TripAdvisor. Revolving 360 degrees every 80 minutes and towering 800 feet high above Las Vegas, the restaurant features unparalleled views of the city and mountains. Executive Chef Rick Giffen’s one-of-a-kind, five-course menu will feature delectable dishes beginning with an Oyster on the half shell Amuse, followed by several choices per course. 1st Course: Lobster Bisque with brandy or Caesar Salad. 2nd Course: Seared Maine Scallops, Crab Cake, Grilled Portobello or Smoked Scottish Salmon. 3rd Course: Filet Mignon & Crab Filled Lobster Tail or Orange Miso Glazed Chilean Sea Bass & BBQ Rubbed Prawns. Fourth Course: Dessert Finalé Chefs Surprise & Chocolate Truffles. Additional options are available, including Vegetarian. A la Carte Menu. Firework seating reservations are available for 10 p.m., featuring the 5 Course Prix Fixe Menu. Guests who book the 10 p.m. Fireworks seating for New Year’s Eve dinner at Top of the World may continue the celebration at the Skyline Spectacular Party on Level 108. For complete menu options, pricing and party buy-up information, visit StratosphereHotel.com/NewYears. Each of the Tower’s parties contains spectacular panoramic views of Las Vegas’ famous New Year’s Eve firework show by Grucci. From chilled champagne to heart pounding house music, each party has something to make this New Year’s Eve unforgettable. Party guests will move to the sounds of DJ CC, with a two-hour premium-brand sponsored open bar, festive decor and party favors from 10 p.m. to midnight. Revelers will delight in the amazing views of midnight fireworks from the lounge that wins a variety of Best of Las Vegas awards year after year. A limited cash food menu will be available. Cost is $199 per person plus taxes and gratuities for admission and open bar. Cash bar from midnight until 4 a.m. Tourists and locals alike can experience a unique club-style party at the SkyLine Spectacular Party on the level 108 Indoor Observation Deck. Party-goers will enjoy the sounds of DJ KITTIE and DJ SOXXI, unlimited three-hour premium-brand bar, Go-Go dancers, atmosphere models, specialty drinks, martini luges and a champagne toast at midnight to go along with the spectacular view of the midnight fireworks. Guests can also experience a wide variety of Executive Chef Rick Giffen’s delectable creations. Admission to the Patron After-Party in the Stratosphere Theater is also included. Party and open bar from 9:30 p.m. to 12:30 a.m.; $250, per person plus taxes and gratuities. Guests can enjoy the ultimate 2018 VIP Tower Party and experience all of the excitement of SkyLine Spectacular Party on Level 108, plus the more intimate parties on Levels 103 & 104. These two additional levels will feature an unlimited four-hour premium-brand open bar, performance artists, signature cocktails, martini bars, a champagne toast at midnight and an extensive menu including award-winning Chef’s specialty food stations to keep guests satiated well into the New Year. Guests also receive complimentary admission to the Ultimate Patron® After Party in the Stratosphere Theater. Party and open bar from 9:00 p.m. to 1:00 a.m.; $350, per person plus taxes and gratuities. The fun doesn’t stop when the Tower parties end. Guests are able to keep their New Year’s Eve celebration going all night long. The great entertainment lineup includes live dancers, a custom light show, DJ QUIRA, DJ STEPHI K and DJ E-NOC with the hottest mix of House, Top 40, EDM and more. Cool off with Patron® Tequila and other premium brands. VIP bottle service packages are available. Party-goers are able to celebrate until 5 a.m.
12:00 a.m. to 5:00 a.m.; General Admission $40, per plus taxes and gratuities. Visit website for Table and Booth Package pricing and details. As hotel rooms will be in high demand on New Year’s Eve, guests are encouraged to book early at Stratospherehotel.com to lock in the best available room rates. After December 1, 2017, Tower Party cancellations will not be refunded. Guests must be 21 or older to attend any event. 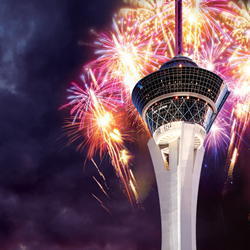 Tickets for all New Year’s Eve parties will be distributed at the Stratosphere Ticket Center beginning Sunday, December 27, 2017. Diners can enjoy a champagne brunch at Crafted Buffet, featuring plate after plate of global cuisine, including Pan-Asian, Southwestern, American comfort foods, regional European flavors, carving stations, and of course, champagne to toast to 2018! Served 7 a.m. to 2 p.m. $23.99 for adults; $12.99 for children (ages 5 – 12) or $5.99 with each paid adult brunch. Children must be accompanied with an adult (prices do not include tax and gratuity). Buffet Dinner will be available from 4 p.m. to 10 p.m.
About Stratosphere Casino, Hotel & Tower: About Stratosphere Casino, Hotel & Tower: Stratosphere Casino, Hotel & Tower is a Las Vegas Strip resort with an 80,000-square-foot casino. The 1,149-foot Stratosphere Tower is the tallest freestanding observation tower in the United States, featuring the Top of the World restaurant and highest view of the Las Vegas Strip from the Observation Deck as well as SkyJump Las Vegas and thrill rides Big Shot, X-Scream and Insanity. Known as a great value to gamblers, Stratosphere is located close to the Convention Center at the gateway to downtown Las Vegas. It features 2,427 guest rooms and suites, uniquely themed restaurants, the Tower shops, MJ LIVE, the world’s most successful Michael Jackson tribute show, The World’s Greatest Rock Show and L.A. Comedy Club, showcasing the hottest up-and-coming stand-up comics. Additionally, Stratosphere’s ace | PLAY™ program allows players to enjoy awards, comps and exclusives based on their loyalty to American Casino & Entertainment’s four properties: Stratosphere Casino, Hotel & Tower on the Las Vegas Strip, Aquarius Casino Resort in Laughlin, Nevada, and two Arizona Charlie’s locations in Las Vegas. For more information, visit StratosphereHotel.com, call 702-380-7777 or 800-99-TOWER (998-6937).